On the fringes of society, Technicians are essential for life. From building and maintaining the ships that transport goods to directly providing the necessities of life such as Tatooine’s moisture farms, technology is inseparable from life in the galaxy. And wherever technology is needed, there will be those who excel at inventing, building, repairing, and upgrading every bit of wire and metal at their disposal. The Technician Specialization and Signature Abilities Decks are on sale now, ready for your ingenuity and fine tuning! 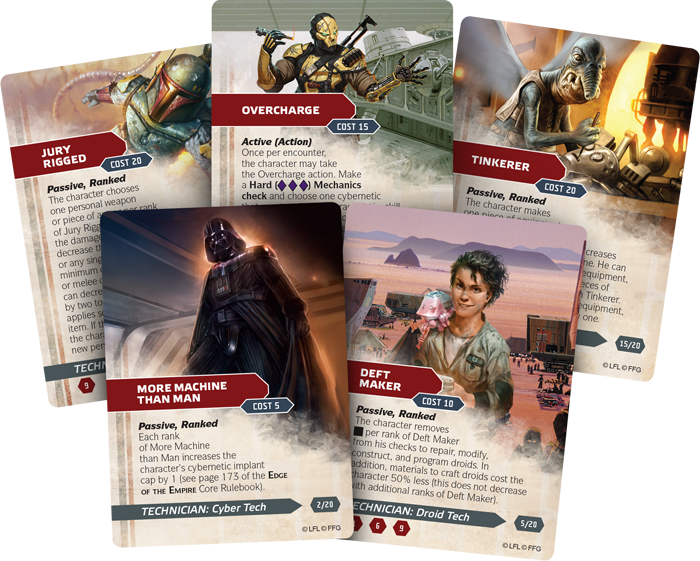 Featuring the new Specialization trees and Signature Abilities found in the Edge of the Empire™ Technician sourcebook, Special Modifications, these 20-card packs each provide a card for every talent found in the three new Specializations introduced. Each card is produced in full color and contains all the rules text needed that makes them a handy tool for players and gamemasters alike. Cyber Tech - Melding the essence of organic and mechanical is the Cyber Tech’s specialty. Through the constant installation and upgrade of cybernetic parts, the Cyber Tech’s quest of self improvement may seem never ending, but the results are no less impressive. The More Machine Than Man talent appears four times in the tree, increasing the allowance of cybernetic upgrades on themselves which would otherwise stifle the Cyber Tech’s pursuit of perfection. Overcharge, and its Improved and Supreme upgrades, pushes the installed cybernetics even harder by increasing the benefit provided by one or more of their installed pieces of technology. Multiple ranks of the Surgeon talent also allow the Cyber Tech to contribute to remedying their group’s medical needs. Droid Tech - Whether assembling a horde of robotic assistants or focusing on a singular masterpiece, the Droid Tech lives to cultivate the usefulness of droids. Some Droid Techs see this calling as a way to make good credits in a galaxy that depends on droids to maintain their way of life, while others may view the value of the work itself as infinite; every optimized power relay, every upgraded subroutine a tally in the ledger of greatness. Droid Techs benefit from the Deft Maker talent while crafting droids, which is complemented well by Eye for Detail’s addition of success or advantage on Mechanics and Computers checks on which such crafting relies. In the field, Reroute Processors can optimize a droid by increasing a needed characteristic while reducing a currently unnecessary one, and Redundant Systems allows the Droid Tech to make needed repairs by scavenging extra parts from another piece of equipment. Modder - Not content to simply build things, the Modder seeks to make everything built better. Whether focusing on personal gear, vehicles, or spaceships, the Modder carries the tools needed to optimize technology as a matter of pride. 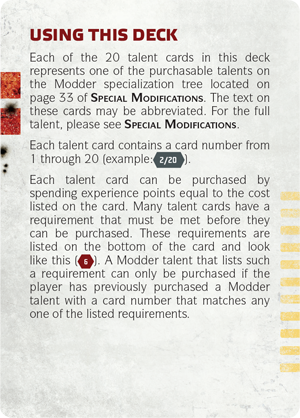 Many of the essential talents in the Modder specialization tree offer multiple stacking ranks, keeping in the theme of utility and optimization. Jury Rigged, Tinkerer, and Gearhead all provide increasing benefits to the Modder’s pieces of equipment whether they are specialized tools or weapons. Resourceful Refit allows the Modder to completely disassemble an attachment and then use those pieces to reassemble a new attachment that will be more useful for the situation at hand. For Modders who wish to focus on ships and vehicles, the Signature Vehicle talent locks the Modder into a pet project which always provides a free upgrade to the Mechanics checks used to upgrade or repair the craft. In addition to the Specialization talent trees, Special Modifications also introduced the new Signature Abilities available to all Technicians who have dedicated themselves to the perfection of their work. The Signature Abilities deck provides a card for each Ability itself, as well as all supporting upgrades that accompany each, all in one deck. Inventive Creation is a very potent and flexible narrative Signature Ability. 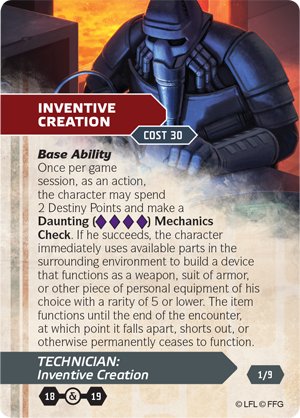 With a Daunting Mechanics check (or Hard, after an upgrade), the Technician may simply create an item of rarity 5 or lower by making creative use of the materials at hand. The nature of this device is up to the player and GM, but after the end of the current scene it simply fails in some way. Important upgrades for this Ability include Increased Rarity (going up to rarity 8), and Change Scale, which places vehicles with a silhouette 2 or lower into reach. Conversely, Unmatched Calibration’s benefit is clearly mechanical. 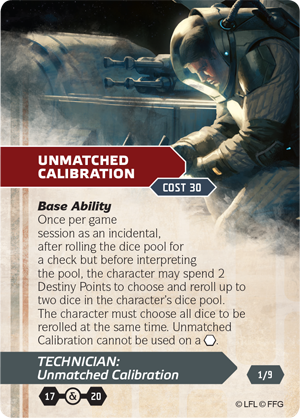 Once per session, the Technician may simply decide to spend 2 Destiny Points to reroll two dice. These can be any dice that are not the white Force die, meaning that the Technician may find themselves lucky enough to eliminate a Despair result, or take a second chance at a Triumph. Upgrades for this Signature Ability include Minimize Risk, which downgrades a rerolled Challenge die into a Difficulty die, or Increase Number which can put the number of possible rerolled dice up to an impressive six. The new Technician Specialization and Signature Abilities Decks are available at your local retailer and our online store today!